This pretty much describes the 1920s. It was a time of iconic invention, daring fashion, the first skyscrapers, surrealistic art, experimental literature, and the age of jazz. Women finally had the right to vote and everyone finally lost the right to throw one back in a saloon. Well, legally anyway. A young lady of the Roaring Twenties wore short skirts, bobbed hair, drank, smoked, and said the most unladylike things if she damned well pleased. Free at last, free at last. The 1920s had so many first and last’s, it sort of boggles the mind. It was the last decade that silence ruled the silver screen. Everything from bubble gum to penicillin made its debut and things we all take for granted today – like refrigeration, sunglasses, and cheeseburgers all first hit the scene in the 1920s. It was the time of Charlie Chaplin, Al Capone, Houdini, Babe Ruth, and Lindbergh. Art, architecture, literature, and music all pushed the envelope. And Art Deco was there to see it all. This style was the streamlined answer to the more fussy Victorian Age. Its influence was seen in everything from architecture to fashion. Bold geometric shapes and vibrant colors were its calling card. When it came to jewelry, recent advances in stone cutting allowed complex designs as diamonds were cut into more interesting shapes. Art Deco celebrated the machine age with skyscrapers, ocean liners, and trains inspiring jewelry designs. It was believed that technology would cure society’s ills. There was hope for the future. The contrasting vivid colors in the jewelry of the time was a direct expression of that optimism. Perhaps no author expressed 1920s optimism as did Fitzgerald in his classic The Great Gatsby. This novel was all about hopefully reaching out for the American Dream. Even when everything eluded you, you still reached for it. That’s what jewelry of this time symbolized. That need for not only a brave new world, but a brave new you. Freedom of self-expression was a new thing in the 1920s. Wanting to stand away from the pack and express one’s inner wild child was not for the faint of heart. Jewelry is how many chose to express themselves. 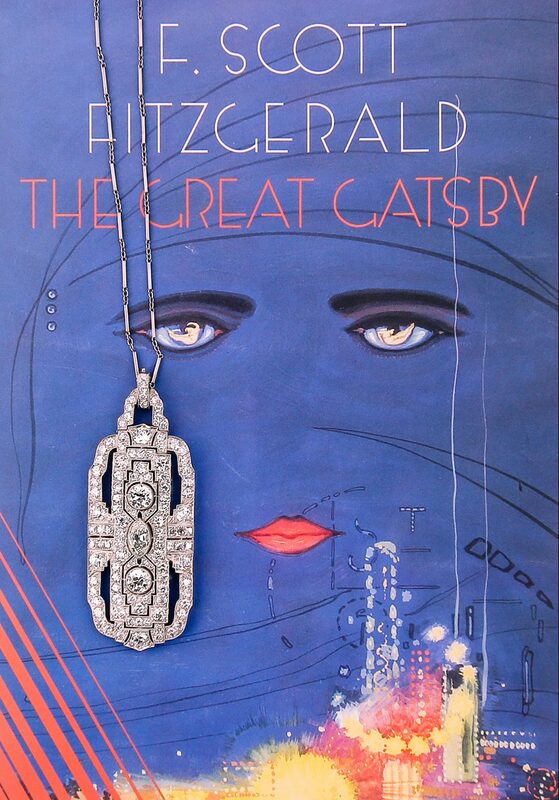 I doubt anyone will forget Daisy Buchanan in the most recent imagining of Fitzgerald’s classic, with Leonardo DiCaprio, sporting that multi-row pearl bracelet with a huge diamond pendant crossing her hand to have a rendezvous with a chunky diamond band on her middle finger. This is the imagination and daring that perfectly represents the jewelry of the Roaring Twenties. Another great influence on Art Deco was the discovery of King Tut’s tomb in the early 1920s. Snakes circling up the arm could be found on any number of ladies at a speakeasy as well as hieroglyphics, pyramids, and sphinxes. The Roaring Twenties was all about making a statement. And the jewelry one wore was part of that statement. Long necklaces were on the menu with layered strands of pearls, large chunky stones in contrasting colors, and tassel beaded necklaces. Long drop earrings were also quite the rage with women shocking the status quo by lopping off their hair and leaving their naked necks exposed. Rings stood taller on the finger with less traditional cuts. 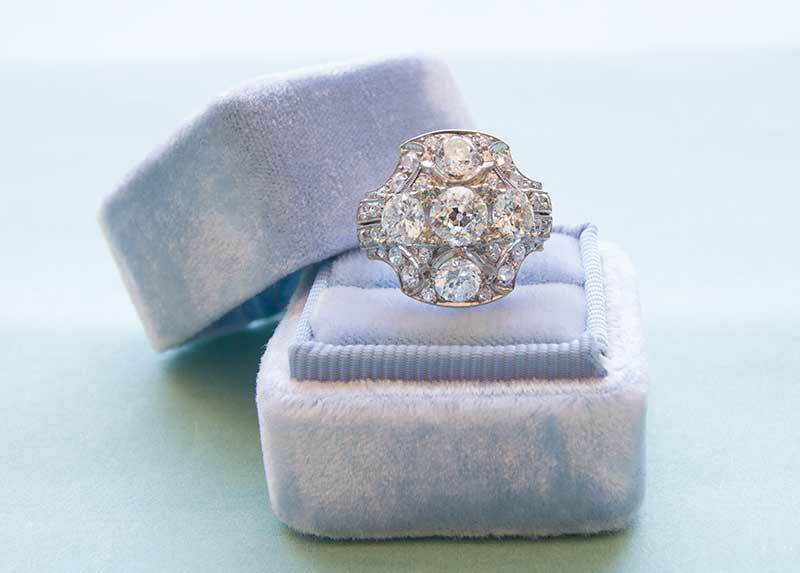 Diamonds were still where it was at, but birthstones were also very popular in rings during this time. When it comes to designs inspired by the Roaring Twenties, there are not just a lot of choices, there are a lot of very cool choices. Maybe a floating corsage platinum necklace with baguette and round diamonds would tickle your fancy. Perhaps a confetti melee bracelet with diamonds in contrasting colors will do it for you. Or maybe you’re in a more sassy mood and perhaps thinking about some platinum and diamond drop earrings with splash of emeralds. Perchance that gold snake bracelet inspired by Cleopatra is more your speed. What with the roaring twenties about to show up again, how do you want to express yourself? Give us a call at 619.223.2151 or drop by and let us help you find a way to do it in a way that would have Daisy Buchanan green with envy.